Although an old stone Charentaise longere this south facing house is full of light and space. 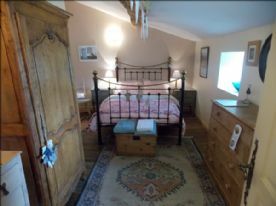 It comprises 5 large double beds, 2 bathrooms, 2 shower rooms It has been tastefully renovated throughout, and offers flexible accommodation. 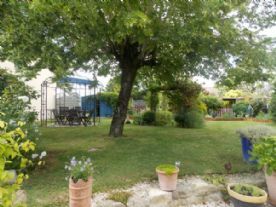 Sitting in large, manageable plot with pretty landscaped gardens, totally enclosed with stone walls so perfectly safe for children and animals, and pool. This property really has to be seen to be appreciated. Kitchen/diner (22sq m) oak flooring. 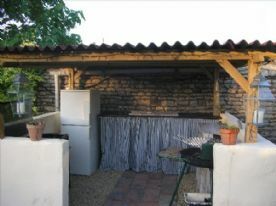 Range cooker; Base unit with belfast sink, dresser, door to front south facing terrace and kitchen garden. 1 radiator. Utility room plumbed for washing machine with deep chest freezer and shelving. 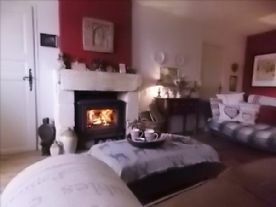 Sitting Room (35 sq m) Oak flooring; stone fireplace with log burner. 1 radiator, 2 windows to front elevation. 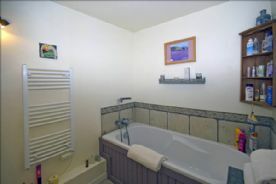 Downstairs Shower room with WC, vanity unit, heated towel rail. 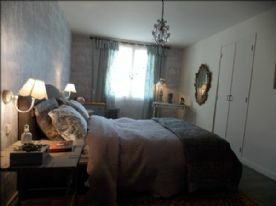 Bedroom 1 (11 sq m) with window to front garden, wooden flooring, fitted wall lights and fitted cupboard with shelving. Bedroom 2 (11sq m) with window to front garden, fitted cupboard with shelving. These bedrooms are served by a Bathroom with overhead shower, sink and bidet. Heated towel rail. 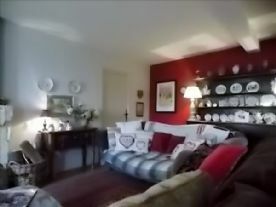 To the rear of the main hallway is the Summer Sitting Room (33 sq m) with exposed stone wall, wooden floor, beamed ceiling, two double French doors leading out to rear terrace and overlooking rear garden. Radiator. 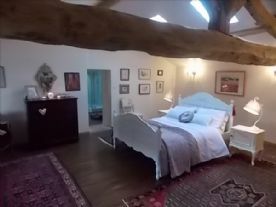 Master Bedroom (35 sq m) with A-frame beam and beamed ceiling. 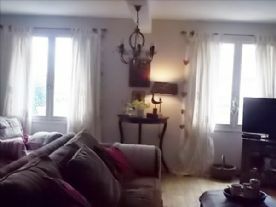 Wall lights, two windows to front of property and two velux windows. 2 radiators. 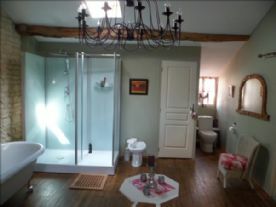 En-suite bathroom (22 sq m) with beams and feature stone wall. 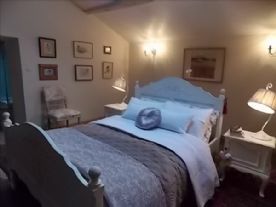 Walk in shower, roll-top claw foot bath, bidet, wc, vanitory unit and heated towel rail. Radiator Large storage cupboard housing hot water tank. Bedroom 5 (10 sq m) fitted wardrobes, beamed ceiling. 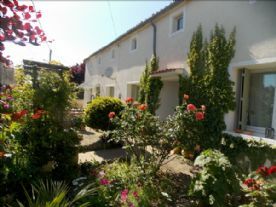 South-facing front patio and garden including well stocked kitchen garden with all the usual herbs. Well stocked flower border. Parking area for cars to the side of the building. Rear terrace with seating areas to take advantage of both sun and shade. 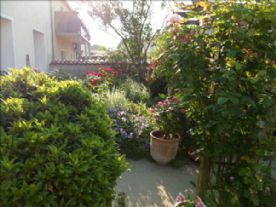 Steps up to lawned garden with well stocked borders, rose arbour, grape vine, pergola with another seating area. Garden shed. Wood and tool store. Gate leading to second garden area containing summer kitchen with gas cooker, fridge/freezer, small electric oven and grill, hob, BBQ. Fenced area with above ground wooden swimming pool and decking area. Small potager for growing all your veg. 2 apple and 2 pear trees. 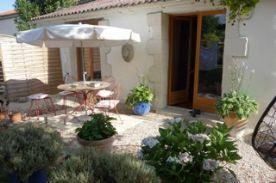 Situated in a rural setting on a quiet road within a village, but which is within easy reach of the market towns of Aigre, Ruffec, Chef Boutonne and Villefagnan offering all commerces. The village is served by a very popular bar/restaurant, post office and has local bread deliveries six days a week; a boucherie/charcuterie delivery service on a Wednesday. 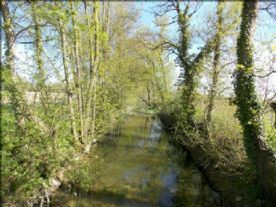 Nearby we have a fishing lake and the river Osme for fishing and peaceful walks and cycleways. There are also two leisure lakes within a 5 minute drive offering beaches and safe swimming for children; and each having restauration in the summer months. 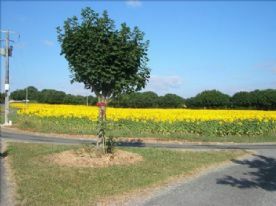 The department of the Charente is reputed to have the second best climate in France with temperatures reaching well into the 30s in the summer months. Winters are short and the sun is back with us as early as February some years. The delightful historical departmental capital Angouleme is 40 mins away where you can find all kinds of smart individual shops and an enviable choice of eateries. 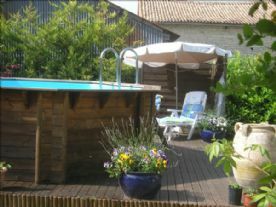 It is situated on a plateau overlooking the River Charente and enclosed by its medieval ramparts. The old castle now forms part of the Hotel de Ville in the Centre of town. Angouleme is host to the world famous Bande Dessine exhibition (international comic books) and also le Circuit des Remparts, a classic car race around the ramparts. The major towns of Poitiers, Saintes and Cognac are also equi-distance away with La Rochelle and Bordeaux approx. 1h30mins. Cheap flights operate from airports at Poitiers (40 mins), La Rochelle (1h30) and Limoges (1h15). Paris is also accessible by TGV train from the nearby town of Ruffec which takes approx. 2 hours.